Maintaining continued focus on our mission, every day. For over 90 years, family owned and operated Lassus Handy Dandy has operated with a sense of responsibility for the well-being of all our employees and their families and to the customers we serve. It is a matter of civic pride. That perspective is the driving force behind all we do. Clean store environments, customer courtesy, good compensation and working conditions are all part of our daily operations. Lassus Handy Dandy also shares its profits within our communities. The Lassus Foundation was started as a continuing way to give back to our communities, and do it in a fair way. Presently, the Lassus Foundation donates to over 60 charities. Customers of Lassus Handy Dandy also have been given the opportunity of choosing their favorite charity from that list. The business landscape has hardened in recent years, with a deep recession and increased competition that include large chain stores with their addition of fueling stations. Although these challenges impact Lassus Handy Dandy, we continue to be resilient and competitive. By concentrating on our mission as a good steward within the communities we serve, we are continually paving our road of success. 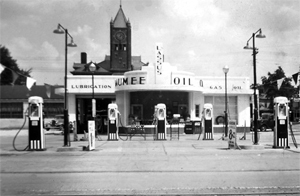 Lassus Brothers Oil evolved in 1925, when August Lassus decided to sell his coal business in order to build a gas station at one of Fort Wayne’s busiest intersections. Within three years he turned the reins over to his three sons Elmer, August Jr. and William, who added gas stations around town, hired mechanics to service cars, and eventually created a wholesale fuel oil distribution division. In 1960, Elmer’s son Jon F. Lassus and his cousin Bill Yarnelle (who eventually sold his interest to Jon F.) — joined the company. Their additions were most welcomed as Lassus Brothers Oil operated six very busy service stations at the time. The 1970’s provided many changes. In 1972, August Lassus, Jr. retired and Jon Lassus became president. 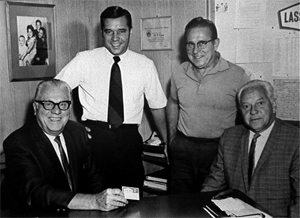 In 1973, Bill Lassus retired and Bill Yarnelle became company vice president and with Elmer Lassus retiring in 1974 a second generation of successful management came to an end. Under the direction and leadership of Jon F. Lassus, the Lassus Brothers Oil Co. began expanding their retail gasoline business and targeting new fuel markets, including Diesel, heavy commercial-grade oil and wholesale gasoline. Additionally, even more service stations were added, thus, the stage was set for yet another successful Lassus Business venture – the Handy Dandy convenience store chain. Lassus Handy Dandy began its convenience food store operations in 1980 as a response to a need in the community. Though Fort Wayne had offered consumers the separate services of gas stations, food stores, and sundry retailers, no retailer had offered a variety of specific items in convenient locations, available at convenient hours. The Lassus Family recognized Fort Wayne as a prime market for convenience stores. Lassus Handy Dandy leadership is now with the fourth generation of Lassus sons – Todd, Jon R. and Greg– as well as Jon F. Lassus, who remains the company’s CEO and chairman of the board. 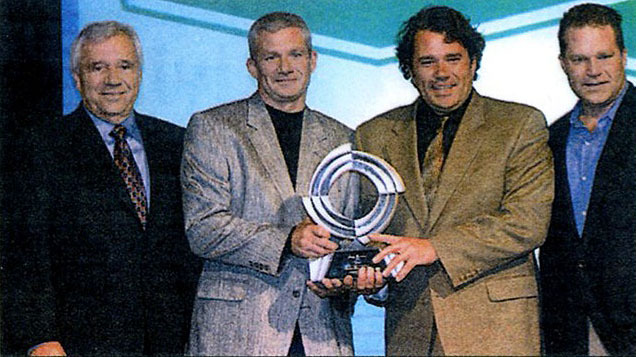 Lassus Brother Oil Inc., owner of one of Northeast Indiana’s largest independent gasoline suppliers and owner of Lassus Handy Dandy convenience stores, was awarded the 2004 Fort Wayne’s Large “Business of the Year”. The awards were chosen from nominations submitted by Chamber of Commerce members. The selection criteria included company growth and community involvement in 2004. Through a business acquisition in the early 1990’s Lassus Brothers became a BP Oil gasoline distributer, selling BP branded gasoline at several locations in addition to their own Lassus Handy Dandy brand at others. As of April 2007 the company had converted most of its locations back to the Lassus brand. “We’ve been with BP for 13 years, and it’s been a good relationship.” says Todd. “But we wanted to become more independent and have more control over our products and distribution. In 2005 Lassus started the “Hometown Rewards” program that offers discounts, coupons and sweepstakes to its registered customers. Customers can designate a favorite charity of theirs and each year each designated charity receives a percentage of funds from the Lassus Foundation which is funded with a percentage of corporate profits. In 2006 Lassus Brothers opened a new Handy Dandy at the corner of Wallen & Coldwater Road. This Handy Dandy had the largest square foot customer area and was the first to offer E-85 fuel in the Fort Wayne Area. Many Lassus Handy Dandy locations feature Higher Grounds Coffee and Elmo’s, Lassus’ own proprietary pizza and sub sandwich business named after Elmer Lassus, known as “Big Moe” to family and friends in the 1920’s The Elmo’s menu features several product offerings including pizza, subs, toasted subs, wraps, salads, sausage rolls, and breakfast sandwiches. All items are available for carryout and an eat-in option is available at some locations. In 2011 Lassus introduced the “Lassus Instant Gas Discount” card. Users of this card receive an immediate 7¢ discount on each gallon of fuel by paying for their purchase with a withdrawal from their checking account. This card saves Lassus Brothers fees from the customer not using a bank credit card and allows the savings to be returned to their customers. Another feature of this card was introduced in 2012, allowing customers to “roll-back” fuel prices to a reduced price. The features allows customers to save even more on every gallon of gas at the pump. In December 2011 a new Lassus Handy Dandy was opened across from the entrance of the new Parkview Regional Medical Center on Dupont Road. This modern facility includes an automated car wash, Drive-Thru window, Elmo’s and Higher Grounds coffee shop and a wide variety of snacks and other convenience items. It also offers not only E-85 fuel for flex-fuel vehicles but also is the first in the area to offer E-30 fuel. E-30 has the advantage of a lower cost than regular unleaded but returns almost the same mileage per gallon. As of June 2018, there are 36 Lassus Handy Dandy Food Stores in Northeast Indiana and Northwest Ohio, and five Lassus affiliates, providing quality fuel and convenience to the neighborhoods and communities surrounding them. All requests for contributions from the Lassus Bros. Oil Foundation should be submitted to Dan Carmichael, Lassus Bros Oil, Inc., 1800 Magnavox Way, Fort Wayne, Indiana 46804. These requests should include a summary stating the name and overall purpose of the organization, details regarding on what or how the requested funds will be spent, and any other information deemed significant to our decision making process. Review and approval of all requests is typically made in September of each year by the Foundation executive committee.